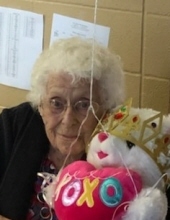 Mrs. Mary Elizabeth Zoller, age 98, of Billings, Missouri, passed away on March 29, 2019 in the Ozarks Methodist Manor, Marionville, Missouri. She was born on March 9, 1921 in Billings, Missouri, the daughter of Frank Earl and Emma (Westerman) Burkey. Mary, just celebrating her 98th birthday, was a life-long resident of the Billings area and member to the St. Peters United Church of Christ. She was preceded in death by her husband, Ernest; her parents; and a brother, James Burkey. Mary is survived by her daughter, Carol Rolufs; two grandchildren and their spouses, Angie and Eric Schmidt and Chris and Tanya Roop; six great-grandchildren, Corey, Riley, Blake, Lexie, Trinity, and Kristy; and many other relatives and friends. To send flowers or a remembrance gift to the family of MARY ELIZABETH ZOLLER, please visit our Tribute Store. "Email Address" would like to share the life celebration of MARY ELIZABETH ZOLLER. Click on the "link" to go to share a favorite memory or leave a condolence message for the family.